These extraordinary times–unprecedented in modern history–are marked by a worldwide depression and regional wars involving all the major imperial powers. This book exposes the roots of the crisis in the unsustainability of the United States’ military-driven empire building based on a volatile speculative economy, and influenced by Zionist policy makers committed to the colonialist state of Israel. It offers a critical study of the collapse of the empire and a profound indictment of the respectable and prestigious personalities either responsible for the debacle, or for its continuance. 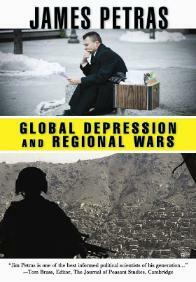 Petras provides clear insight into how the ramifications of the world depression and regional wars that originated in Washington and on Wall Street are extending throughout the world, provoking popular challenges especially in Latin America, while reinforcing the belligerency and increasingly fascistic nature of the state of Israel. He demonstrates how unending wars and a deepening capitalist depression have demolished the ideology of free market neo-liberalism and forced to the forefront the need for structural changes. He points out how the collapse of the capitalist free market and the need for large-scale, long-term interventions by the state have once again raised the question of whose interests states are presently promoting, and whose interests in actuality they should serve. Both in the United States and Latin America, center-left regimes are proposing economic reforms to try to save the capitalist system. However the deepening crisis is raising the prospect of mass support for 21st Century socialism, which focuses on public investment, ownership and control. James Petras is a Bartle Professor (Emeritus) of Sociology at Binghamton University, New York. He is the author of 64 books published in 29 languages, and over 560 articles in professional journals, including the American Sociological Review, British Journal of Sociology, Social Research, Journal of Contemporary Asia, and Journal of Peasant Studies. He has published over 2000 articles in nonprofessional journals such as the New York Times, the Guardian, the Nation, Christian Science Monitor, Foreign Policy, New Left Review, Partisan Review, Temps Moderne, Le Monde Diplomatique, and his commentary is widely carried on the internet. His publishers have included Random House, John Wiley, Westview, Routledge, Macmillan, Verso, Zed Books and Pluto Books. He is winner of the Life Time Career Award, Marxist Sect i! on, of the American Sociology Association, the Robert Kenny Award for Best Book, 2002, and the Best Dissertation, Western Political Science Association in 1968. Some recent titles include Unmasking Globalization: Imperialism of the Twenty-First Century (2001); co-author The Dynamics of Social Change in Latin America (2000), Unmasking Globalisation (2001), System in Crisis (2003), co-author Social Movements and State Power (2003), co-author Empire With Imperialism (2005), co-author) Multinationals on Trial (2006). His most recent title, The Power of Israel in the United States (Clarity Press, Inc. 2006), has been acquired for Japanese, German, Italian, Indonesian and Arabic editions. He has a long history of commitment to social justice, working in particular with the Brazilian Landless Workers Movement for 11 years. In 1973-76 he was a member of the Bertrand Russell Tribunal on Repression in L a! tin America. He writes a monthly column for the Mexican newspaper, Le Jornada, and previously, for the Spanish daily, El Mundo. He received his B.A. from Boston University and Ph.D. from the University of California at Berkeley.